January 2017, CWC is transforming Blythe into a high flying super model with an ANNA SUI X Blythe collaboration. The doll is named Blythe Adores Anna. (When translated in Google this is the name that appears. This may not be the correct name). ANNA SUI is a well known fashion designer from America. Her fashion style consist of colorful textile which have a whimsical feel about them. ANNA SUI collaborated with a lot of companies, too many to list right here, but a few companies she partnered with were Target, Hush Puppies, Sailor Moon, Coach and now Blythe is joining the ranks. Anna Sui made her debut in Japan in 1997. 2017 will mark her 20th anniversary in Japan. On May 4, 2016 an exhibition titled "ANNA SUI PARTY" took place at Isetan's Shinjuku Store to celebrate this milestone. At the event custom dolls were on display wearing fabrics from Anna Sui's collection. Each doll had an extremely limited quantity. 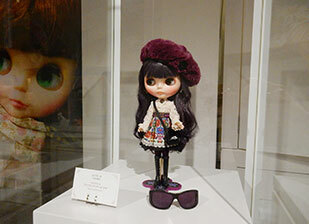 Blythe's were limited to 2 each & cost ¥200,000 about $1,800. 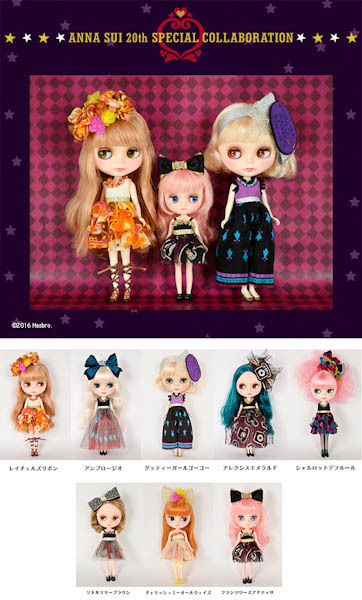 Middie Blythe were limited to 1 each & cost ¥130,000 about $1,170. 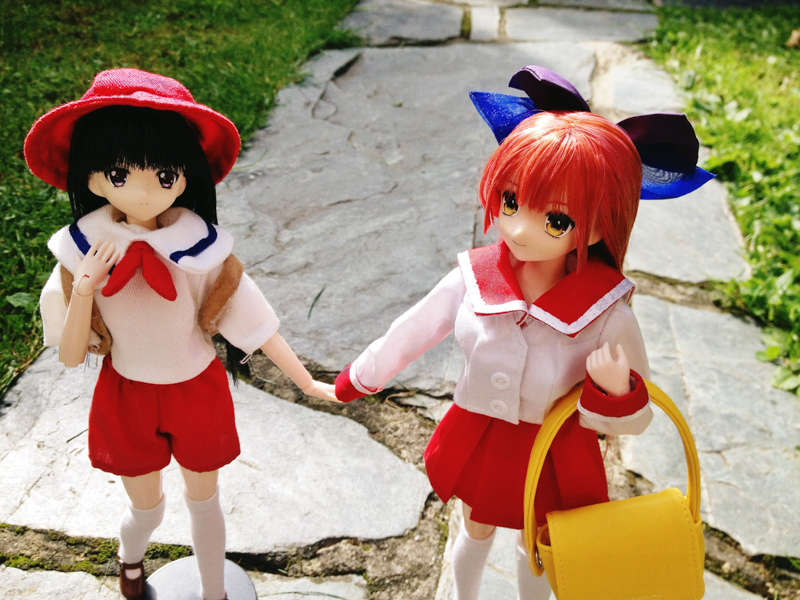 Fans could only bring home these dolls by way of a lottery. 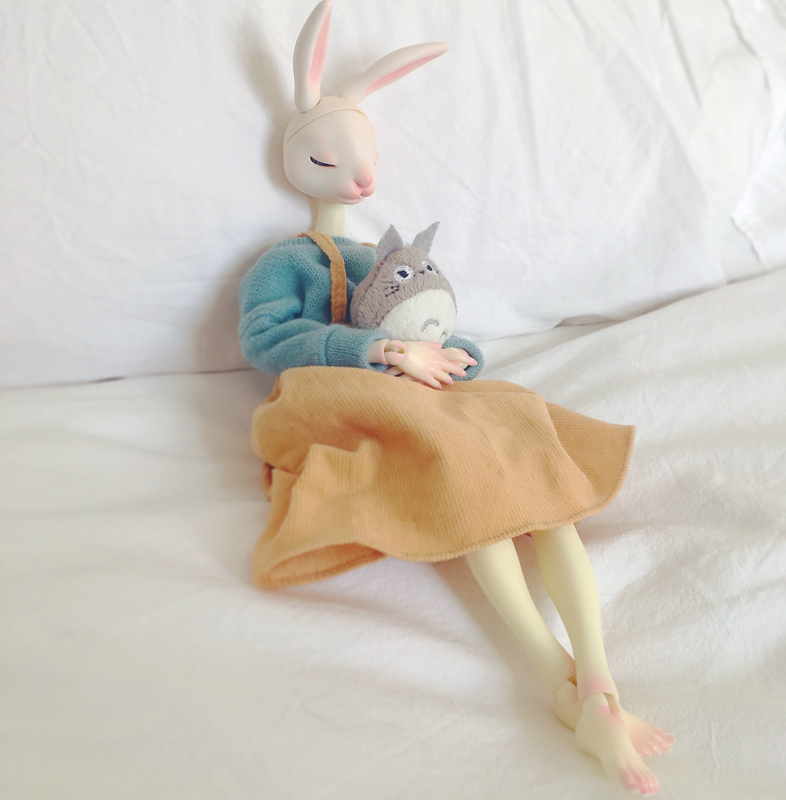 A few of the dolls appeared on Yahoo Japan auction & other Japanese auction services. 1 sold recently for ¥160,000 about $1,441. Fast forward a few months later, a wider audience will have a chance of owning an ANNA SUI Blythe doll. At this time, CWC hasn't made an English announcement about this release. There is no info on whether Blythe Adores Anna will be a lottery doll or not, but I suspect she will given how popular the exhibition dolls were. If I had unlimited funds, I would grab this girl in a heartbeat! The price for Blythe has been steadily increasing each year and I wonder if this is something we should come to expect with Blythe releases including collaborations. The lavender purple tone & butterfly detail which is a common trait for ANNA SUI looks spectacular! I'm also crazy in love with Blythe Adores Anna's outfit, though kooky it has a sophisticated air. 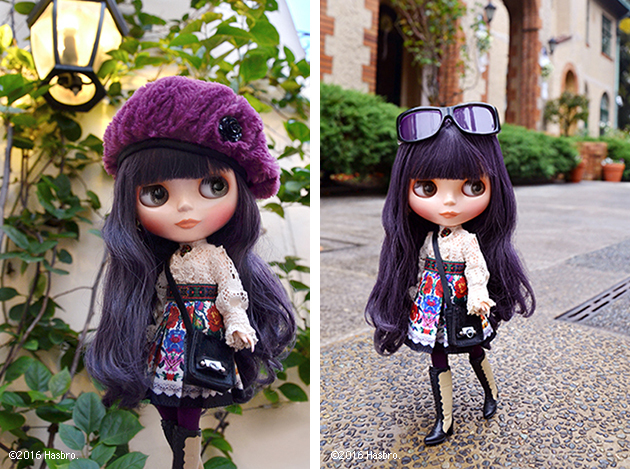 Blythe looks very mature in her oversized shades, purple tights, and stylish beret. I wasn't familiar with Anna Sui but thanks to the arrival of this gorgeous doll I'm a fan of ANNA SUI. Hopefully an infinite amount of money, will cross paths with me soon, so I can splurge on this doll and a couple of Anna Sui's clothing pieces. 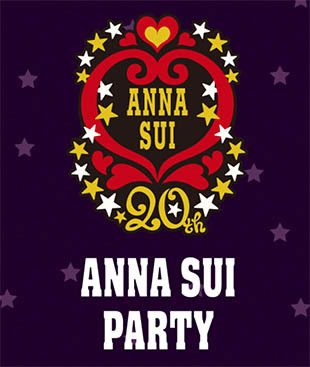 I'm curious to see what your reaction is to such a prestige fashion collaboration with ANNA SUI! Did you know of ANNA SUI before this release & if so, do you find that this doll is a great representation of the brand? What is your favorite feature of Blythe Adores Anna? 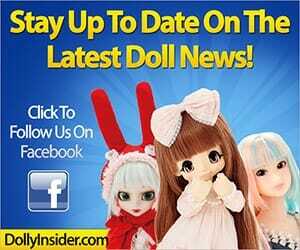 Do you like it when CWC offers lotteries or do wish CWC would get rid of it and release dolls as a first come first served bases? Leave your comments in the box below! I recently entered the lottery for Blythe Loves Anna doll but didn’t win. Will there be any way of buying her anywhere even if I didn’t win the lottery? I’m sorry to hear that your name wasn’t drawn. And C C Toys may offer her for sale. I hope you are able to bring her home. Now I haven’t gotten into Blythe dolls yet. I’ve never even seen one in person. But that one in the little picture she has light pink curly hair with green eyes. Wow she catches my eye! Gorgeous! 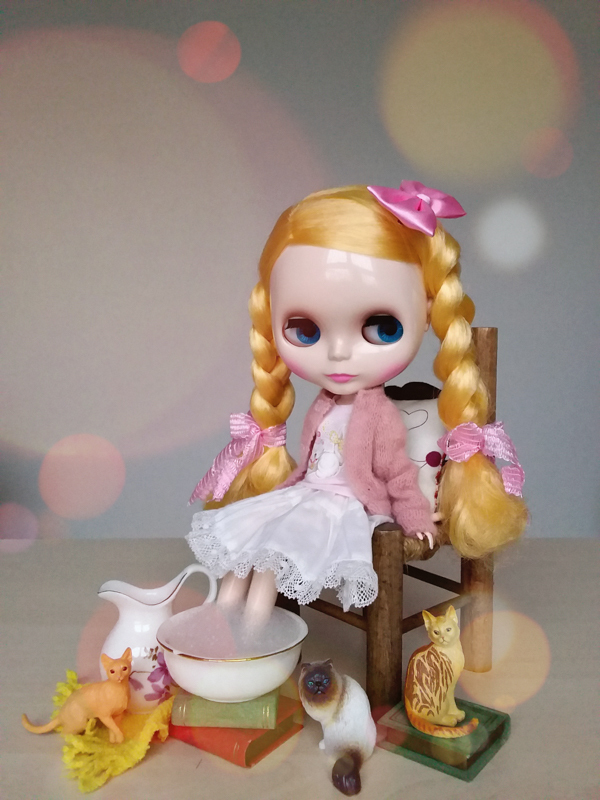 Oh the cutie who caught your eye is the 2014 Neo Blythe named Charlotte des Fleurs :). Her head is bigger than Pullip and her neutral expression differs from Azone’s delightful look. But all these traits make her incredibly charming. Oh my goodness. This design is so beautiful, I can’t wait to see final photos. I suspect she will be a lottery item as she is too good to be true! Hit enter before I was done. I am a fan of Anna Sui and this Blythe collab is a perfect representation of the brand in muted, gothic yet vivid colours, and retro floral pattern. I love her blouse and intricate details, and I’m hoping her hair will have a subtle hint of purple in it like the illustration suggests, and not just be a dark grey. I’m not too sure about the beret but we shall see. Blythe has gone up too far in price for me, especially with the fall of the pound, but I can see why they charge the amount they do. 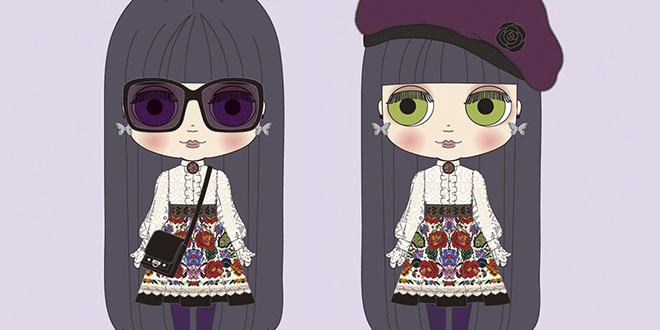 Oh that’s great to hear that Neo Blythe Adores Anna represents ANNA SUI’s brand well. This Blythe’s outfit does have a lot of detail which is a nice surprise. I hope it translates well on the actual doll. I’ve noticed the changes in the yen hopefully in the months to come, the yen will be gentle for international fans. Thanks for adding your voice to the conversation!